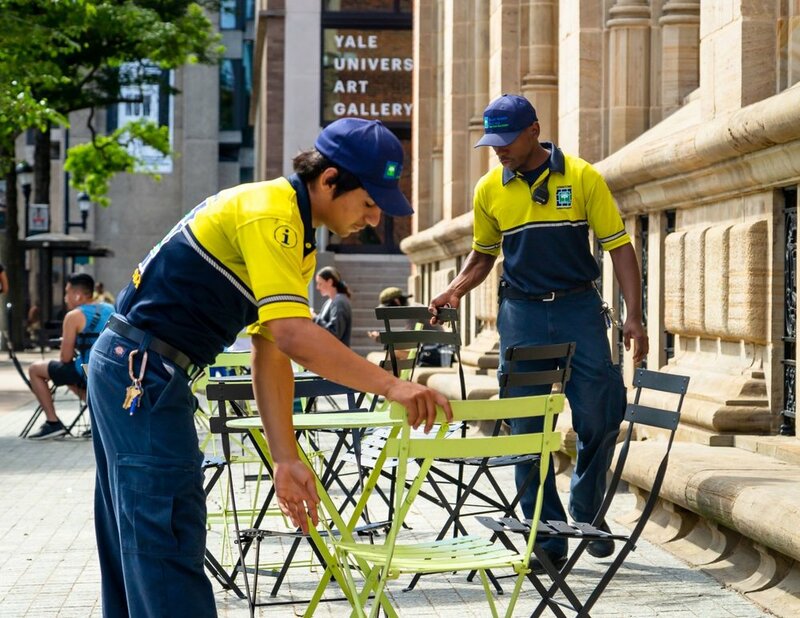 With 25 trained staff providing a wide array of services, Town Green District's downtown Ambassadors keep downtown New Haven clean, safe and thriving for those who wish to live, work, and play here. Our team waters 2,500 flowers and parks daily throughout the spring and fall seasons, all a part of maintaining a beautiful downtown. An investment made in 2016, Ambassadors spend evenings sweeping streets and sidewalks with the TenantS20 mini streetsweeper. Ambassadors keep winter at bay shoveling and snowblowing ADA ramps, curb cuts, and walkways in addition to spreading pet-safe de-icing agent. Through a partnership with District 1 Police, Safety Ambassadors consistently patrol to enhance the quality of life Downtown. The Ambassador team maintains 7 inviting seating areas, featuring 70 tables, over 220 chairs, and 16 umbrellas across the District. Our Ambassadors provide friendly faces to visitors of Downtown New Haven, offering directions and tourism suggestions. Always on the lookout, our team reports streetscape damage and issues from downed tree branches to cracked sidewalks and unlit street lights.